Most standard models are made with stainless steel or a comparable alloy as well as natural rubber latex, dry natural rubber, or PVC (poly vinyl chloride). There are also electronic stethoscopes that use a microphone and low-noise amplifiers that are specially designed to pick up many inaudible sounds. Stethoscopes will vary in style and quality from one manufacturer to another but most will have similar components. Here are a few of the standard stethoscopes we’ve found. Electronic Stethoscopes – Electronic stethoscopes are normally considered a huge improvement over acoustic stethoscopes. They have a better frequency response which allows the user to hear many sounds a normal stethoscope couldn’t. Electronic stethoscopes use state-of-the-art amplification and filtering systems to provide advanced auscultation for health care workers. But since they provide superior acoustics and clarity, many mechanics use them as well. The chest piece houses the electronic stethoscope’s innovative technology, including microphone and low-noise amplifiers, that offers up to 10 – 15 times the amplification of the most advanced conventional stethoscopes. Most will have a volume-control dial and listening mode button incorporated into chest piece, allowing the stethoscope to be easily operated with one hand. They are battery operated so make sure to keep a supply handy. Acoustic Stethoscopes – An acoustic stethoscope operates by transmitting sound with the use of hollow tubing and a chest piece. The chestpiece consists of two sides, the diaphragm and the bell, that pick-up sound in a different way. If the diaphragm is used it will transmit high frequency sound, while the bell will pick up low frequency sounds. Double-Sided – Double Head – Dual Head (Combination) Stethoscopes – Consist of a bell and a diaphragm. With the double sided stethoscope, the user should open (or index) the bell or diaphragm by rotating the chest piece. When the diaphragm is open, the bell will be closed, preventing sound from coming in through the bell and vice-versa. Triple Sided – Triple Head Stethoscopes – Both the double head and triple head stethoscopes have a diaphragm and bell. The triple head also utilizes a corrugated diaphragm for additional auscultatory capabilities. Tunable Diaphragm Stethoscopes – A stethoscope equipped with a tunable diaphragm allows the user to hear high and low frequency sound without rotating the device. Disposable Stethoscopes – Disposable stethoscopes allow the user to throw them away after use. They prevent cross-contamination. Many factors contribute to acoustic response. Make sure to check your stethoscope regularly. Normal wear and tear, like keeping it in your pocket, may cause obstructions. Stethoscopes rely on airtight seals o transmit sound. Loose parts or cracked tubing can prevent this seal. The proper headset alignment and the fit of the ear tips are also major factors. There are also differences in hearing from one individual to another, we at TheMedSupplyGuide.com recommend trying different stethoscope models before purchasing. The Ear Pieces – There are three types of ear pieces. There are the older threaded ear tips, snap-tight ear tips, and newest soft-sealing ear tips. Proper fitted ear tips are necessary to achieve optimal acoustic performance. The Tubing – The two most popular tube designs are dual tube design and the single lumen design. The dual tube design consists of two internal tubes, each one going to a separate ear. The single lumen design allows sound to be carried to both ears through a single tube. It is said sound quality is better carried in the dual tube design. The Bell – When indexed the bell allows the user to listen to low frequency sound. The Diaphragm – When indexed the diaphragm allows the user to listen to high frequency sound. The Chest Piece – The chest piece contributes to the sound quality in a stethoscope. The weight and width of this component will contribute to the sound intensity. Many cardiology stethoscope users have questions regarding the length of the tubing. It has been said that a shorter tube will provide for a better acoustic response. Instructors in some medical programs recommend their students buy the shortest tubing possible. Is this a myth? Consider this. As tubing length increases, resonant frequency decreases and lower frequency sounds increase. Heart sounds normally are considered to have a lower frequency. So what’s the verdict? According to 3M, who did testing on there Littmann series, found that “there is only a small difference in sound between a short tube and long tube stethoscopes”. It is so small that the human ear can’t tell the difference. A longer tube may actually pickup low frequency sounds better. Longer tubing will also give the individual more freedom when working with patients and may relieve back pain. So its a toss up. The manufacturer and style of your stethoscope will ultimately determine the quality of sound regardless of tube length. In one study, 80% of 200 stethoscopes from four different hospitals and clinics were found to be contaminated with at least one microbe. Staphylococcus accounted for 83% of the microbes cultured–and 58% of those organisms were methicillin-resistant. The study also found that 90% of the stethoscopes owned by physicians were contaminated. Nurses’ stethoscopes came in a close second. 79% of the ones they owned were found to be contaminated. So disinfect your stethoscope regularly. 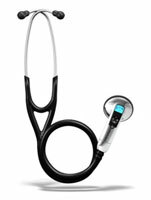 3M Littmann Stethoscopes – Manufacturer – Littmann stethoscopes are used worldwide. A wide variety, in both traditional and single-sided tunable diaphragm chestpiece designs, are available to meet virtually every auscultation need. Littmann stethoscopes’ amenities for doctors and patients include nonchill rims, patented 3M™ Littmann ® Snap Tight Soft-Sealing Eartips, anatomically correct eartubes, excellent warranty and service programs, and a choice of contemporary tubing colors.The standards for stethoscope performance, sound transmission, efficiency and comfort for both wearer and patient have come a long way from Rene Laennec’s rolled paper. Listening to body sounds and interpreting their meaning is truly an art in the hands of a trained health care professional using today’s advanced acoustical stethoscopes. Welch Allyn Stethoscopes – Manufacturer – Welch Allyn’s offers a wide variety of reliable, accurate stethoscopes with exceptional acoustics. They provide models for every situation and preference. Dr. Francis A. Welch and William Noah Allyn developed and built a hand-held, direct-illuminating ophthalmoscope that was first sold in 1915. The company now manufactures a wide array of data collection, lighting, and medical diagnostic equipment. Welch Allyn operates several subsidiaries such as Welch Allyn Protocol and manages various partnerships, alliances, and licensing agreements with other medical equipment companies. Other Welch Allyn products include therapeutic devices, cardiac defibrillators, and patient monitoring systems.